PaxLair Site 10 - Lord British Visits PaxLair! 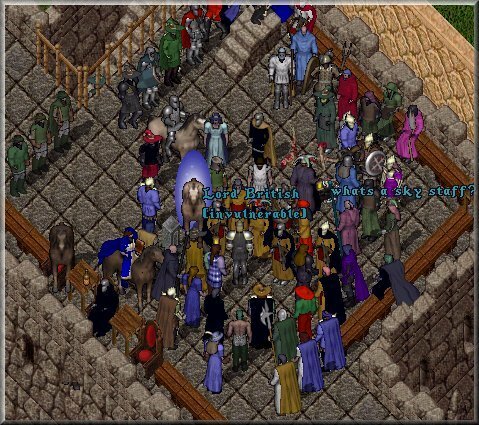 During the PaxLair Founders and Builders Festival Wednesday (November 11, 1998) night, Lord British [confirmed to be played personally by Richard Garriott] arrived to speak to the people being honored with building such a fine town. He came up the Mage Tower steps to the roof, accompanied by Lord Vargon and Seer Daemeon. Twas a wonderful gathering of people and we were awestruck by Lord British's presence. Atlan - Quest Coordinator of PaxLair, who brings detailed player-quests for all to enjoy. Goatboy - The god who helped build PaxLair's fine furnishings through countless hours of intricate work. Gorbag the Orc - The pioneer of a race of beings who brings much enrichment to PaxLair and Britannia. Green Dragon - The Ambassador of PaxLair who works with many people in and out of town to make PaxLair known. Katelynn - The Defense Minister of PaxLair who takes on the most difficult problems of defending the town for peace. Luigi Aeillo - The proprietor of the first Pizzeria in all of Britannia. Mystarr - The Mayor's Chancellor, who deals in all things about PaxLair. Soulweaver (Red) - Who placed the Mage Tower and other fine buildings in PaxLair to establish our foundation. Thelorn - The Leader of The Band and founder of Second Chance Provisioners, the first real shop in Britannia. WildMike - Who placed the first stone in PaxLair at his shop, the Southern Comfort Salery, and works commerce issues with the Mayor. Winfield - The Mayor of PaxLair, a servant to all. Winmere - The Lady of the Spring of Knowledge in PaxLair, who is involved in many things that keeps PaxLair moving forward. Lord British made special notice when I mentioned the founders of of PaxLair, "The Band." He said, "I have heard tales of the "band"!" I wish I could have introduced everyone in PaxLair who have contributed immensely to the town. The list would go on for days. With the added commotion caused by his visit, I was unable to mention the fine groups of elves, vampires, orcs, dwarves, necromancers, shopkeepers from the Survival Shop, alchemist shop, tavern, instructors from academy, Father Time's and Sinbad's UO Chesapeake, and the player-seers of Britannia. All these groups, citizens, and visitors in PaxLair are what has made PaxLair a grand place today. I sincerely thank all of you. Lord British then gave PaxLair a precious gift. A plaque that reads "Proclamation Of Distinction By His Royal Majesty Lord British." With a blink of his eye, he took me to the front of the tower doors. With his own two hands, he mounted the plaque directly over the Mage Tower doors. It shines there today as an example of what people can really succeed in by working together in Britannia. This is a night I and many will not forget. Lord British does care about the hard working people in Britannia and he watches over us. Thank you Lord British for honoring PaxLair and thank you everyone for making PaxLair what it is today.